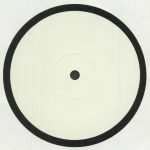 Review: The Australian edit machine known across the globe as Late Night Tuff Guy offers up two sublime dancefloor weapons from his armoury for the second in his series of limited, hand stamped Tuff Cuts 12"s. "Ain't Nobody" from Rufus and Chaka Khan is a classic, and has been subjected to numerous edits and reworks over the years; this version from Late Night Tuff Guy belongs amongst the better ones, looping and extending the original and laying it over his trademark crunchy slo mo beats. Face down, the "Back To Life" accapella is joyously diced and laid down over a glistening disco production from the Nile Rogers and Bernie Edwards discography. 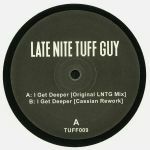 Review: Australian techno royalty Carmelo Bianchetti has put out a lot of music under the Late Night Tuff Guy alias with his 2007 tweak of Roland Clark classic "I Get Deep" among his best work. Originally released through the short lived TBot's All Nite House Party label, the track is given a timely reissue through Bianchetti's own Tuff Cut label in newly remastered form. Clark's classic vocal would be arguably be a hit over anything with a 4/4 groove, but there is something satisfying about this grimy arrangement from LNTG. Complementing this is a fresh take on the track from Sydney's Cassian. Review: Late Nite Tuff Guy bursts through RSD 2016 with a hot selection of disco-flavoured house chuggers, and we'd been waiting on a comeback from both the dude and label - all boxes ticked from our side. "Hold Tite" is the perfect summer blazer, all luscious vocals and dripping beats, and "I Don't Like Acid" takes that same soulful spirit but strips the groove right down to a bopping little rhythm that is likely to be enjoyed by both hip-hop and house fans alike. The flip's "One Night In A Disco" is a sample-heavy, string-infused floor-melter, whereas "Shelter Me" goes all balearic and feet-up - the perfect lounge cut.